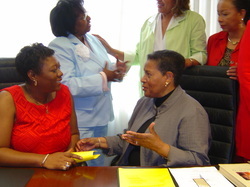 Myrlie Evers-Williams is someone I read about in history class while covering the civil rights movement. I saw the movie, Ghosts of Mississippi, portraying her struggle for justice following her husband, Medgar Wiley Evers', brutal slaying. I read newspaper articles about her activism and efforts to run for a seat in California's House of Representatives in the 24th district. I never thought in my lifetime I’d meet this civil rights activist and icon, let alone interview her while on assignment for WJTV; Jackson, Mississippi's local CBS affiliate. Our paths crossed as she made her way from the airport gate to the conference room situated on the second floor of the Jackson Evers International airport. She was here for a press conference. She was being escorted by two women; One on each arm. Their voices were so loud and filled with laughter. It was like watching old friends share an intimate moment. Myrlie Evers-Williams’ journey to Mississippi was to promote her latest book, The Autobiography Of Medgar Evers: A Hero's Life and Legacy Revealed Through His Writings, Letters, and Speeches. It so happens, her visit also fell on the eve of the 42nd anniversary of Medgar Evers’ murder. On June 12, 1963, Medgar was shot in the driveway of their Jackson home. He was the husband she couldn’t save from dying in her arms nearly 42 years ago. He’s also a man she doesn’t want the south nor the world to ever forget. A sentiment evident in a passage I read once in a book titled, I Dream a World. It’s a portrait of black women who changed America, by Brian Lanker. In one short sentence, I felt Myrlie’s suffering crystalized, “The first year after Medgar’s death, my fuel for survival was hatred”. Imagine, in order to mourn the man she loved, she had to hate? That’s unfathomable. Well, today, Myrlie is back in the Magnolia state to talk about her book and some of the feelings she’s harbored over the years. She reminisces about a discussion with her late husband while facing the Cascade Mountains of Oregon, right before coming to Mississippi. “Medgar, I’m tired. 50 years is long enough”. The tone in her voice hints that this book was cathartic. She also explains what the book is about…Medgar’s life and body of work before his murder. The book cover is of Medgar Evers’ bloodied driver’s license. “I was so filled with hatred until it was my driving force. My love for Medgar and what he had done, I had to swim or drown. It was a fight for survival”; a fight to battle her demons. She recounts one moment that made her pause and put her feelings in focus. “One incident helped change the bitterness I had not just at whites, but blacks as well. At the time, it took my then 8 year old son yanking on my dress reminding me, "Mommy – Daddy says you shouldn’t hate”. That moment she says was a turning point for her. “I am blessed, I am so blessed. I think we all have a purpose for being here. God did not put you on this earth to take up space. Medgar had a reason for being here. I believe we have a reason for being and people will be inspired”. She touches the book in a loving manner, as though she were affectionately rubbing Medgar’s shoulder. She paused, looked around the small room. She took a moment to address all the women sitting around the “U”-shaped table. She praised them for their effort in pushing the city of Jackson to rename the airport from the Jackson International Airport to the Jackson-Evers International Airport. “I look forward to the day when I guess the exhibit will be changed and people will not be angry and upset, but they will be able to rejoice in this forward movement”. A movement, Myrlie considers a small victory for the civil rights struggle and vindication for her beloved, Medgar. “To everyone who worked to get the name in…I truly wanted more than what’s there. But, you win some – you lose some and I’m glad we have the last name there. It says to me that progress has been made. It says that the naming or at least including Medgar’s last name is something that he would never have thought of...not have necessarily wanted, but… it speaks to progress in the state and that those people who have worked so hard see this come about still remember him and his work and his contributions and continue to honor him”. Myrlie still honors her late husband by continuing to carry his name. Although it had been rumored she vowed never to return to the magnolia state, her focus turned to how the rest of the world views Mississippi. “I do get tired of having people still point to Mississippi and say you’re still rotten, you’re still at the bottom of the list. I was born here. I love it, believe it or not? I do. But, the opportunities are there if only we will seize them”. I sure seized the opportunity to pick Myrlie’s brain after the press conference. It’s not everyday I get to speak to a strong, powerful woman of words. She's a mover and shaker on the social landscape. I wanted to walk away from this meeting knowing as much about Myrlie and her struggle as I could possibly learn. Especially, after wondering why the poster board positioned behind her was never mentioned during the press conference. It is pictured below. The poster board had eight images depicted on it. It’s a tribute to the life of Medgar Wiley Evers. It will be part of an exhibit put on display at the airport. That’s thanks to the support of some of Mississippi’s most influential civic leaders…the likes of Ineva Pittman and Nettie Stowers. “I thank you for grabbing onto this and not giving up. I really do”. Myrlie continued, “There are too many people in this state that have worked so hard that need to be recognized”. Like the images that appear on the teal colored poster board, they also merit recognition. If no one else in that room wanted to know the significance behind the images selected… I sure did. I wanted to know what they meant to Myrlie. I wanted to know what story lay behind these images. Why were those specific photographs chosen to be placed on display at the airport museum? I didn’t want to have to wait to read about their significance from a newspaper article or a history book in the future, when I could actually learn about them from the woman who lived through them. She was sitting right in front of me with a bright smile ready with insight; ready with answers. I had no time constraint or deadline to meet for the station. Besides, this interview was more of a personal moment to learn about her and the pain she’s been carrying and sharing with the world. However, there was a time constraint on the part of Myrlie. She was on a book signing tour and due at Lemuria Bookstore in North Jackson within a couple of hours. Although she was pressed for time, she graciously extended me the honor to be inquisitive without boundaries. She was fascinated by my curiosity over the poster board; I was fascinated by her. It's one of my most treasured and uninhibited personal interviews. I started by pointing to the first picture. It was of a bust of Medgar Wiley Evers, framed in red. “This is a bust of Medgar that was commissioned by General Mills a few years ago. It’s a valuable to come home to Jackson, Mississippi and to be used in the airport if indeed that is the desire of the people”. I then pointed to the next photo on the board. It was a black and white photograph of a very young Medgar Wylie Evers in uniform. With a grin she points as if caressing the photo, “That's a very, very early photo of Medgar of when he entered the Army. Medgar lied about his age. I think he was sixteen or so and he said he was eighteen to be able to go in service. You can tell how young he looked”. At that moment, it seemed as though she were looking at the picture with pride and thinking…“That’s my Medgar”. Then, we moved on to the third photo…A statue of Medgar. The mood turned a bit somber; bittersweet. “This is a photograph of a statue”…Myrlie pauses briefly then continues, “Uhm, that is on Medgar Evers Drive in Jackson, Mississippi. It’s the only one of him anywhere of this size. And, for the citizens, the women who came together who worked so hard to raise the funds for this I’ll be eternally grateful for that”. All the photos on this board reflect revered moments stamped in time. These moments seem to be so intimate, but with Myrlie’s blessing, they have been released and are being shared with the world. It’s reflective of the life she has lead...at first, very private, but to later become very public. Through her grief, she faced adversity. With her determination, she brought together a divided nation. Through persistence, she overcame hatred. It’s all reflected in these images strewn together on this poster board. This fourth picture is one of those private moments that most of us wouldn’t want to share, but for Myrlie, I guess it was therapeutic; a chance to show what life was like before tragedy. “This photo is one of Medgar and I sitting on the sofa as young newlyweds”. With envy in her eyes, she enjoys a quick jaunt back in time. “I look at how small I am and I’m envious but you can tell the holding of the hands and the big smiles – the beginning of our life together”. A life with Medgar that was short lived, but, will forever be remembered like the moment she’s about to embark on. “The next photograph is one that must have been taken in ‘62 or ‘63. As he is confronted by one of the policemen here because I believe that is when he, Roy Wilkins, Amos Brown and a few others were demonstrating in downtown Jackson, Mississippi”. The next photograph was quite interesting. Myrlie is dressed all in white, Medgar in his Sunday best – they are about to board an airplane. It was the epitome of life in the 60’s; it reminded me of the Kennedy-esque, Camelot era. However, their eyes and facial expressions don’t exactly reflect the same carefree smiles that JFK and Jackie O would have had in a similar frame. Medgar appears en garde while Myrlie appears somber. “This is a photograph of Medgar and I about to board Delta Airlines some years ago in the first part of his job with the NAACP. I look at this and I think how different things are today. I travel with my gloves and my high heels…He, in his suit and what not – the very proper attire. But, I think Medgar was about to make a speech at some place and I accompanied him”. Her eyes suddenly glaze over with sadness. "This photograph, was taken the day of Medgar’s burial at Arlington Cemetery". She explains she did not have her third child, James, in attendance because she thought he was a little too young. "I have since been told by him that I had him miss a very historical point“. With resilience and a regretful sigh, Myrlie identifies each person in the photograph. "This is Charles Evers, Medgar’s brother who was here with us. This is our son, Darrell, who was nine at the time. Our daughter, Reena, was eight at the time and of course, President Kennedy and myself". I felt if she were able to go back in time and change this meeting, James would have been there. “At that meeting, President Kennedy, presented me with a copy of the proposed Civil Rights Act and autographed it for me. That’s one of my treasures. I still can’t read…I can’t decipher what he wrote, but, I do recall what he told me and that is...”that as sad as it was… Medgar’s life would help to assure that this legislation would pass”. This photograph is a photograph of our three children with an oil painting that someone did of Medgar. That’s in the bedroom of our home in Claremont, California when we moved there one year after Medgar’s assassination. “I see many things in that photograph. Of course with Medgar as a head because he remained that for so long. Determination in our son Darrell. Also I see the hurt and the pain with him and the kind of frustration with the youngest and my daughter just kind of being resolved that we are honoring dad, but, we’re still sad as he’s not with us. So it’s…uhm…It’s a …I think a very nice family portrait. But, there are many more that I hope in time we will be able to put together as an exhibit here in the state. I believe we have a reason for being and people will be inspired”. – touching the book. The book was created for her kids as a scrapbook to get to know their dad from her perspective.